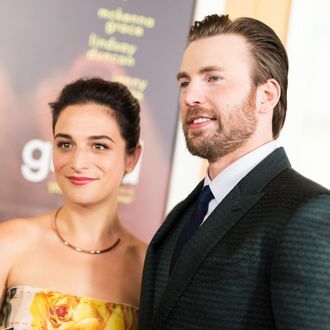 No wonder spring is taking its sweet time to arrive: Jenny Slate and Chris Evans have broken up again, setting the world order askew. In a New York Times profile about his lead role in Kenneth Lonergan’s play Lobby Hero, it appears Evans and Slate have called it quits. In a curious parenthetical, the Times says “their on-again, off-again relationship, beloved by the internet, recently ended.” Slate told Vulture about their romance (which began on the set of Gifted) and breakup last spring, but they got back together a few months later. Let the compliment tour begin!